Home Everything else 15 High-Tech Gadgets for Grandma and Grandpa. Collection of ‘High-Tech Gadgets for Grandma and Grandpa’ from all over the world. Leeo Smart Alert Nightlight: This smart device connects to your existing smokealarms, keeps track of them and sends notifications to your smartphone when something is wrong. Just plug it in and it connects to your home’s Wi-Fi and monitors the safety devices in your home. Apart from this it also monitors temperature and humidity. And you can set your nightlight’s hue in 16 million color options and brightness from anywhere. Droplet: Droplet is a smart button that lets you track important activities you don’t want to forget. This wireless button can be attached to anything that needs a reminder. You can use it for setting reminders for healthy living, daily tracking, household activities, nighttime routines and more. All you need to do is simply attach Droplet to an object and tap it when you complete the task. It will record it through its app so you can keep track of your activities and goals. You can set it to only remind you if you have forgotten the task, how and when you want to be reminded. It comes with a smart hub, and multiple buttons can be connected to one hub. You can configure Droplet to alert the other family members if shared chore is forgotten and more. 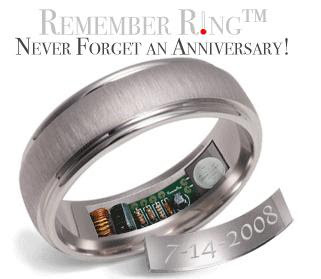 Remember Ring: 24 hours before your special day begins, the ring’s interior will begin to warm up to 120º F for approximately 10 seconds. And the ring continues to warm up every hour, on the hour, all day long! Ivee Voice Activated Assistant: Simply plug Ivee in and it connects to your home’s Wi-Fi network; just say “hello Ivee” and start talking. It listens for your verbal commands, allows you to manage and control your home’s connected devices. Ivee controls other devices with the sound of your voice from thermostats, electronic locks, hubs and wearables. It even fetches live Internet content music, news, weather, stocks and more. Pretty Smart Lamp: The Pretty Smart Lamp is a smart Bluetooth-enabled lamp that lets you find your phone, recharge your gadgets, alert you of notifications, and works with your smart thermostat. To find your phone, double tap it and your phone’s flashlight will activate and your phone will ring. You can use USB cable to recharge your phone directly from the lamp. It can detect the surrounding temperature and communicates with your smart thermostat to keep you comfortable. Using its app you can select any color you like and control the brightness. TrackR Bravo: This quarter-sized device will make sure you find your misplaced keys in no time. Using its app you can quickly locate your misplaced items in seconds. Its distance indicator lets you know how far away you are from your items and finds the exact location. If you can’t see them (hidden under the couch), then just make it ring by a tap on your smartphone. You can use its 2-way finding capabilities to find your phone, just press the button on your TrackR, and your phone will ring. It’s supported by Crowd GPS Network, which makes things a lot easy if you happen to leave behind your keys. You can track multiple items on its app and its fully customizable that means you set the app to ring a certain tone when you leave something behind. Its app is compatible with iPhone and Android smartphones. It has many more uses apart from keeping track of your keys, use it to find purses, iPads, and more. DaVi: This smart device allows you to open or close your existing windowblinds using your phone. It’s really simple to install and works with all 2″ windowblinds. This solar-powered device supports Zigbee and Bluetooth. It allows you to control the windowblinds individually or as a group. And if the room gets too warm, it can automatically close your windowblinds for you. StoryHome: StoryHome is a connected storytelling device that connects kids with their grandparents. StoryHome is an effort to reduce the distance between kids and their grandparents as families have spread over different continents. It makes it easy for grandparents to tell great stories. With a simple push of the button, the story starts recording and is sent to another device at the bedside of their grandkids. It glows just before bedtime, notifies kids that its time to hear a tale from their grandparents. The kids lift it up from its base and bring it out of sleep-mode, holding it in their hands, and listening to their grandparent’s voice and fall asleep. To get started, power up the device and connect it to the Internet by plugging it with a LAN cable into your router or set up Wi-Fi using our app for Android and iOS. The device connects to its cloudserver and it will light up, it’s your cue to tell a first story. You can also answer one of the 1000 life questions, read a book or just tell your own tale. The device will then automatically send the stories to the rest of the family. Your stories are sent through the StoryHome Family Cloudserver. Using your computer you can access these stories, edit, organize and save all your stories. Apart from these you can manage accounts, change the time when stories arrive, push or block stories to devices, and invite the extended family to listen. Using its app, your extended family and friends can also connect, listen to stories, ask questions and even tell their own stories using their smartphone. Bathroom Door Lock: Designed by H Deng this door lock mechanism for bathroom is quite innovative; you can program in a phone number and amount of time you need to use the toilet, shower, or bath. Once it’s done, each time you close the door and press the “go” button after the allotted amount of time is over it sounds for 30 seconds during which you can still turn it off and then its followed by loud noises and a phone call to the programmed number. It’s ideally suited for elderly people who tend to fall in the bathroom.